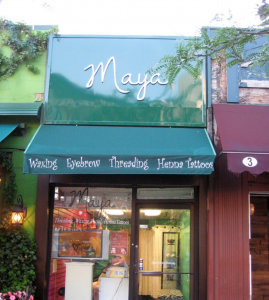 Maya is a neat and cozy salon run by a team of experienced staff for more than a decade. We offer our services with equal priority, be it a new customer or repeating ones. Customized service, affordable rates and great location is what makes our salon stand out. Please visit our Testimonials page to find what our customers have to say about us. We specialize in threading, waxing, facials and Henna tattoos. Our salon is conveniently located at 3 Greenwich Ave, Manhattan, New York and is easily accessible by public transport as it is located just steps away from major stations like West 4 St. (A,C,E,M,F,B,D trains) and Path train at 9th Street. We are open from 10.30 A.M. to 8.00 P.M. 7 days a week. We are closed only 3 days in a year which is Thanksgiving Day, Christmas Day and New Year’s Day. Though walk-ins are accepted for short duration service like facial threading, we suggest you to get an appointment for other long duration services like arm, leg, body, bikini or Brazilian waxing and Henna Tattoo etc. Jyoti, the owner of this salon, is a certified cosmetologist and has more than a decade of experience in the kind of services we offer. She has been associated with this business since it was established back in 2005. The bunch of positive feedback from her customers explains a lot about her expertise.